On Mondays, I meal prep. If you follow me on Instagram, you’ll see my #mealprepmonday stories where I share what I make for breakfast and lunch throughout the week. This salmon salad is my go-to for lunches because it’s simple to prepare, inexpensive, healthy, filling and easy to package individually to grab each morning. Tuna salad was one of my favorite lunches my mom made for us growing up. I know that not everyone finds it appetizing, but it’s a comfort food for me. I make the same recipe now, but use canned salmon instead of tuna. Why? 1- I think it tastes better… it is not as dry as tuna and is less fishy. 2- it’s healthier. Tuna can have very high mercury content, so I try to avoid it now. Plus, salmon is truly one of the most nutritious things you can eat- it is full of omega-3 fatty acids, vitamin D, magnesium, and calcium. It’s also full of protein, helping to keep me from craving snacks throughout the day. This recipe should only take 15 minutes to prepare and makes enough for 3 servings. Drain the salmon and put in a bowl with mayo, relish and salt & pepper. Once eggs are boiled, peel and then use an egg slicer to dice. Add eggs to the bowl of other ingredients and mix. Add more mayo/relish to taste, depending on dryness of salmon. Serve on top of salad greens or on your favorite sandwich bread or crackers. P.S. I’m able to buy most of these ingredients at Thrive Market – check out their selection of discounted healthy groceries here. Read this blog post to see other items I purchase on their site to keep my all-organic grocery spending low. Now that my baby is almost a year old, we’ve got nearly 6 months of solids food eating underway. It has been such a fun experience watching her explore food. She is an incredible eater compared to most kids her age and I am thankful she is always willing to try new foods. When I was pregnant, I read the book Bringing Up Bébé (highly recommend!) that shares bits of wisdom from French parenting. One of the main topics in the book was about kids’ eating and it really struck a cord with me. The idea is this: Kids Eat What Parents Eat. It involves eating mostly real food, eating a variety of food – including lots of colorful vegetables, tasting new items, having a healthy relationship with eating habits, and eating together as a family. When we were getting close to starting solids with my daughter, I started to research more about how to implement this practically and discovered Baby Led Weaning (BLW). (FYI: Weaning in this case simply means the introduction of solids, and not weaning from breastmilk.) BLW takes into practice the whole idea above in a safe way for little babies as they are learning how to eat. Babies have been eating what their parents ate for thousands of years- far before we had blenders to make purees or little baby spoons. Many nations around the world follow the BLW way naturally. Family Meals: Sharing food together as a family and in community are important to me. Developing this habit early was a big goal for me. The biggest benefit practically is that baby sees you eating and mimics you- both being willing to eat what you eat and copying the way you eat (chewing, bite sizes, using utensils). This also begins to teach a baby how to behave at a dinner table -I think has already had a positive effect on our ability to eat in public without causing a scene and actually getting to eat our own meals. Confidence & Independence: Giving my daughter the ability to learn how to eat has given her confidence in trying new foods and starting to be self-sufficient. It also gives me a much-needed break as I don’t always have to sit there spoon feeding her. Safety- Chewing Before Swallowing: When babies start with purees, they are used to getting a large amount of food in their mouth and swallowing. When they start solids from there, food often must be cut very tiny so they do not choke. BLW teaches babies how to chew before swallowing. It also teaches how much is appropriate to bite off of an item and how much will fit in their mouth. Since babies have a stronger gag reflex when they are younger, it is the perfect time to teach this skill- I have seen my daughter fill her mouth and start to gag, learning to spit it out and try again rather than forcing it down and choking. Developing Tastes: Have you tasted baby food? It’s bland and disgusting. It doesn’t taste good to us, so why would a baby want to eat it? Babies are born with a full set of 10,000+ taste buds and are just as eager to enjoy their meals as we are. There is no reason to stay away from various flavors or spices. My daughter can eat food just as spicy as I like it and she prefers her food to be well-seasoned. She loves chili, Tex-Mex and BBQ! Learning by Touch/Senses: We all know that babies learn by putting things in their mouth. They explore the whole world this way. As I put various items from our meals on her tray, she gets the chance to touch everything- the different textures and sizes- and develop her grasp. She also gets to experience the smells and colors of her food much better than she would through a puree. Babies are drawn to color (as we see in their toys) and this translates to the food they eat as well- often, my daughter will choose the orange sweet potato or green bean or red beet over white bread. Convenience: I don’t have time to make homemade purees. When we go out, she just eats whatever I order. And at home, she eats whatever I cook. I’m not making special meals for her or accommodations. It’s simply easier on me. The Baby-Led Weaning Cookbook – contains the important basics of BLW for a short read and some super practical recipes you and baby will both enjoy. I also joined the Baby Led Weaning for Beginners Facebook group to see helpful pictures and videos, answers to questions and tons of tips. I started following it about 2 months before we started and it was more helpful than anything! When to Start: No sooner than when baby is 6 months of age, can sit unassisted, has lost the tongue-thrust reflex, and has an interest in food. Safety: Choking risk is the number one reason I hear that people are afraid to try BLW. As I mentioned above, BLW does not increase choking risk. The key thing is to learn the difference between gagging and choking. Gagging is a reaction that helps prevent choking and teaching them how not to choke- letting them work it out and learn. Watching videos on the Facebook group and knowing the signs for gagging vs. choking are important. As always, it is important to know child CPR as a parent, and that knowledge should help you be more confident when your baby eats. An easy way to distinguish: If they are loud & red, let them go ahead. If they are silent & blue, they need help from you. Don’t offer whole nuts or popcorn or peanut butter on a spoon- items that can easily stick to/in their throat. Quarter (lengthwise) round foods to avoid lodging in the windpipe: blueberries, grapes, cherry tomatoes, sausage, string cheese, carrots. Season generously but limit the salt/sodium. Since your babies kidneys aren’t fully developed, too much sodium can cause them harm. This is another good reason to avoid processed food. No teeth? No problem. My daughter did not have teeth when we started. She still would mimic my chewing and those jaws + saliva are powerful at breaking down foods to swallow. You would be amazed at how she learned to pull at a strip of meat with her gums and chomp on it a few minutes before swallowing. This girl loved steak even before she had teeth. Food Before One Is Just For Fun: For the first couple of months, my daughter really did not eat a lot. She would taste and chew and explore, but would swallow very little. And that is perfectly normal and okay. Breast milk or formula is still a baby’s main source of nutrition before the age of one. What do you think? Is this something you would try with your baby? Have you tried it and loved it (or hated it)? I would love to hear from you! Apologies for being quite absent lately…. it’s been 3 months since my last post- eek! I have a few drafts in the works, so you will see some more blog posts in the coming weeks. Is there anything specific you want to hear about? Let me know!! It’s hard to believe that Thanksgiving is next week! We sure have lots to be thankful for this year. Our baby girl is already 10 months old and is such a happy, fun baby. She’s adventurous and always on the move… I think she may start walking soon. I’m so very thankful that we’ve been blessed to continue with exclusive breastfeeding still even with all our troubles in the beginning. She also loves food, which I can thank the Baby Led Weaning process for- I’ll be sharing all about introducing her to solids here soon. I’m also thankful to work for a company & manager that have been supportive of me as a working mom and allowed me to go part-time. It’s allowed for much better balance in my life and I am blessed to be able to spend more time with my daughter. Just a few months ago, I was in absolute survival-mode; now I can breathe again. On Mondays, I try to prep our breakfast & lunch meals for the work week, so I’ll soon be sharing my favorite recipes like overnight oats and paleo broccoli salad, as well as some go-to weeknight meals. In the meantime, follow me on Instagram @chrissysu and #healthyandhopeful – I am always showing my #mealprepmonday routine and recipes on my Story. I hope y’all have a wonderful Thanksgiving with family and friends. God Bless! If you haven’t yet joined Thrive Market, you are missing out! Think of it as Whole Foods + Costco + Amazon. It’s a membership-based online store full of healthy non-perishable food and household products at fantastic discounts. Plus, they have a great mission to provide healthy groceries to families in need. In my recent post about buying all-organic groceries on a budget, I recommended this as one of my favorite ways to save money (and time)! Here are a few of my favorite items to purchase and how they compare to the prices I was paying at Whole Foods and elsewhere. Einkorn Spaghetti – made from einkorn flour, an ancient wheat that is not toxic like today’s wheat and even safe for many who are gluten-free. 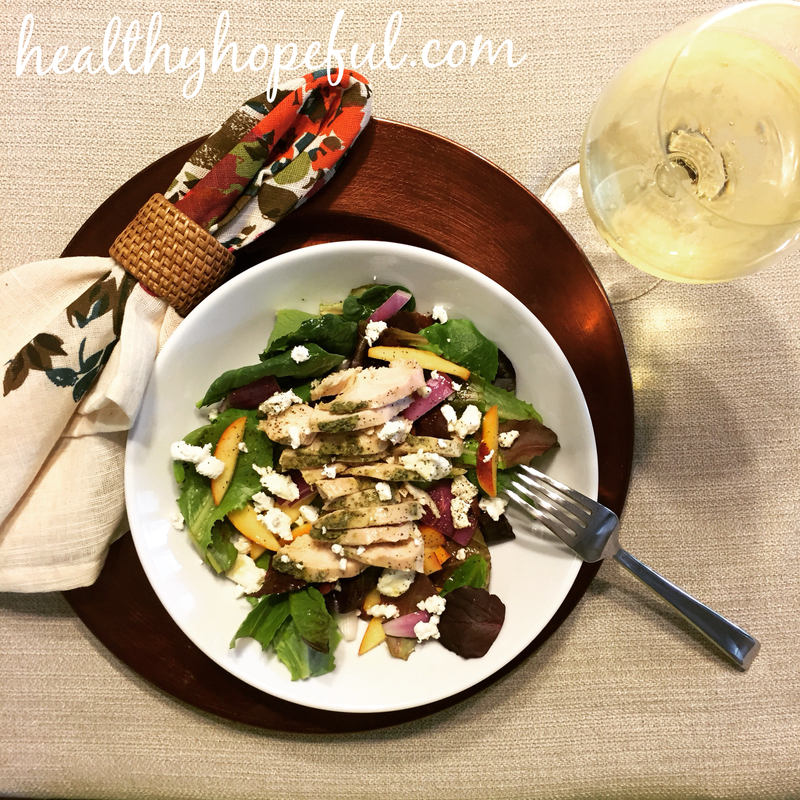 Honey Mustard Vinaigrette with Avocado Oil – this is the healthiest, yummiest salad dressing you can get… very rare to find one made without toxic vegetable oil! Raw Turkey Dehydrated Dog Food – I recently made the switch to this raw dog food and my pup loves it! Learn more about why I switched here. Grass-Fed Beef Bone Broth – I make lots of my own chicken bone broth, but never my own beef bone broth. Nitrate-Free Grass-Fed Beef Sticks – these are my favorite easy protein snacks! Sign up now and save 15% off your first order by using this link! Plus, they will donate a Thrive Membership to a family in need when you purchase yours. P.S. you always get free shipping on orders over $49! Y’all. Memorial Day weekend is this weekend. Crazy. Summer is officially upon us. If you are trying to lose those few extra pounds for swimsuit season and looking to add a few more veggies into your diet, here are a few easy salad recipes to take advantage of the abundant fresh, seasonal produce right now. Lots of color = way more appetizing (and instagram-worthy). Plus, the variety of colors means you are getting a variety of nutrients. If you want to make a salad a meal, you’ve got to add protein to keep you full. The easiest (and cheapest) ways I’ve found to have this on-hand to add are: pre-cooked hard boiled eggs or shredded chicken – find my two-step chicken crock pot recipe here. Or if you want to be fancy, add grilled wild-caught salmon for some healthy Omega-3s. A store-bought or restaurant dressing can quickly turn your “healthy” salad into a calorie-loaded fat bomb. Pre-made dressings are filled with preservatives and vegetable oils. Vegetable/canola oils are full of free radicals that cause serious damage to your cells, meaning that your salad has become nearly as harmful to your health as those french fries you really want to eat instead. Learn more at my favorite doctor’s website here. 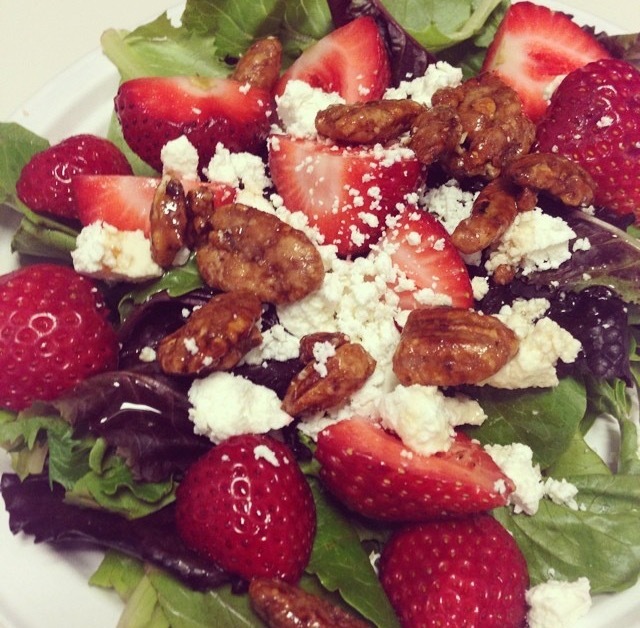 Strawberry & Pecan – Slice strawberries and add to raw baby spinach. Add pecans (or even better, honey-roasted pecans) for some crunch. Top with either goat or feta cheese for some tangy-ness. Another great item to add to this salad: snap peas. Make a simple balsamic vinaigrette for this one; it pairs perfectly with the strawberries. Put the following ingredients in a jar with lid and shake: 1/2 cup olive oil, 1/4 cup balsamic vinegar, 1 tsp raw honey, 1 tsp Dijon mustard, 1 clove minced garlic, salt & pepper to taste. Peach & Goat Cheese (pictured above) – Slice some fresh peaches and lay on a bed of mixed greens. Add some goat cheese crumbles and walnuts for crunch. Top with a peach-basil vinaigrette: 2 parts extra-virgin olive oil to 1 part peach vinegar (find this at your local farmer’s market – I get it from Hill Country Olive Co.). Whisk with chopped basil and a pinch of sea salt. Variation: use other flavored vinegar to mix it up.. some of my favorites are the pineapple, pear & lemon. 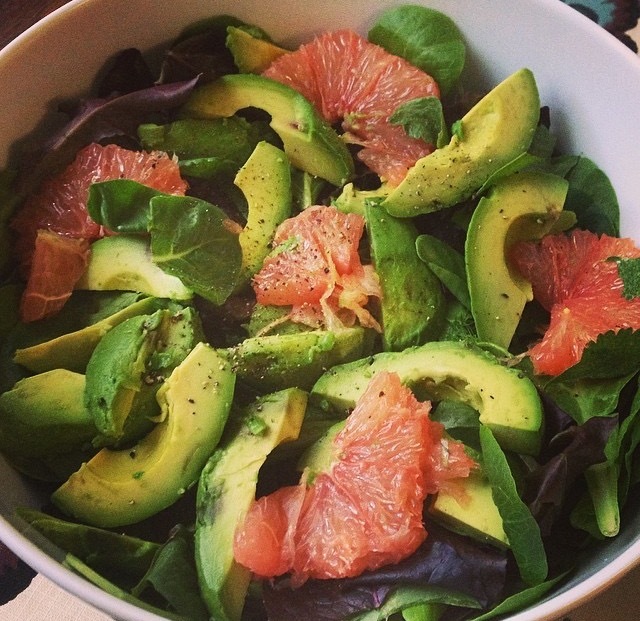 Grapefruit & Avocado – Peel and slice half of a ruby-red grapefruit and an avocado. Pair with mixed greens and add sunflower seeds. Add thinly sliced cucumber for extra crunch. This is best with a sweet honey mustard dressing: Mix 1 Tbsp white wine vinegar, 2 Tbsp Dijon mustard, 1 tsp raw honey with 1/3 cup olive oil. Add dash of salt, pepper, & garlic powder. Caesar Salad – Chopped romaine with cherry tomatoes, topped with grated Parmesan cheese. The easiest way to make homemade Caesar dressing is by blending 1 cup olive oil with 1/4 cup lemon juice, 2 tsp Dijon mustard, 1/2 cup Parmesan cheese, 1/2 tsp each of: garlic powder, sea salt, and pepper. I often add a few Italian herbs from my garden to the mix – rosemary, thyme, oregano. To make it creamy, add 2 Tbsp of plain Greek yogurt. Mexican Heirloom Tomato – Nothing beats fresh heirloom tomatoes… slice one and season with a pinch of sea salt. 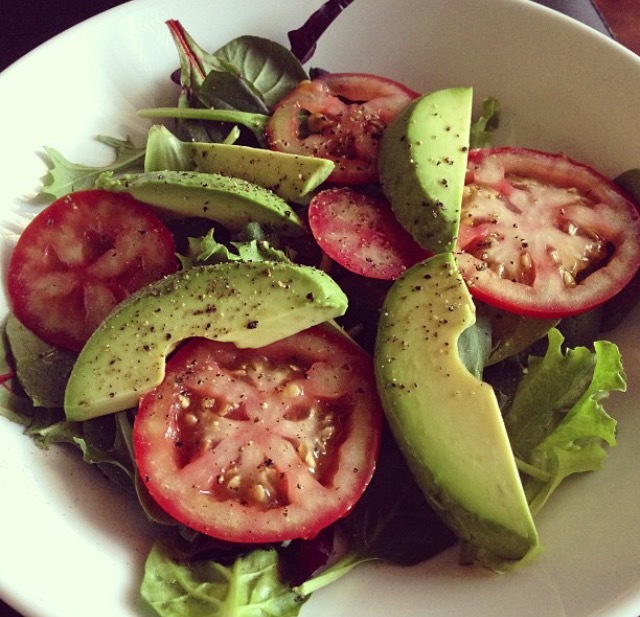 Add with sliced avocado to an herb salad mix. Shredded raw cheddar cheese is a perfect topping for additional flavor, and a few tortilla chip crumbles for crunch. The dressing for this one is one of my favorites – cilantro-lime vinaigrette. Mix 2 Tbsp white wine vinegar, 1/4 cup lime juice, 1/4 cup chopped cilantro, 1 pressed garlic clove with 1/2 cup olive oil. Add dash of salt & pepper. Happy Summer & Bon Appétit!